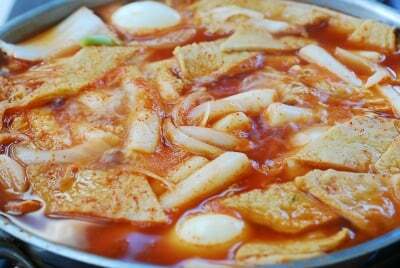 Today, I have another recipe for spicy tteokbokki (떡볶이) for you! 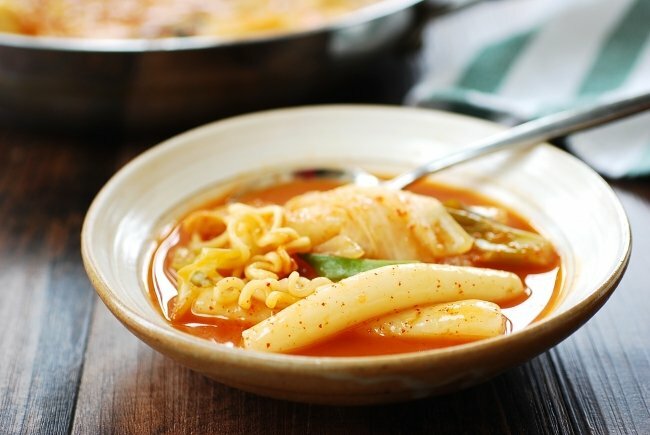 In case you’re new to the dish, literally translated “stir-fried rice cake”, tteokbokki is one of the most popular snack/comfort foods at home and on the streets of Korea! 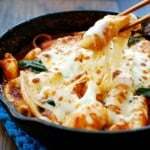 The other spicy tteokbokki I have on the blog has been enormously popular! 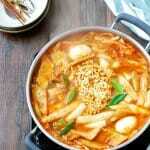 I hope you also love this soupy version called gukmul tteokbokki (국물 떡볶이). Gukmul refers to the liquid in the dish. 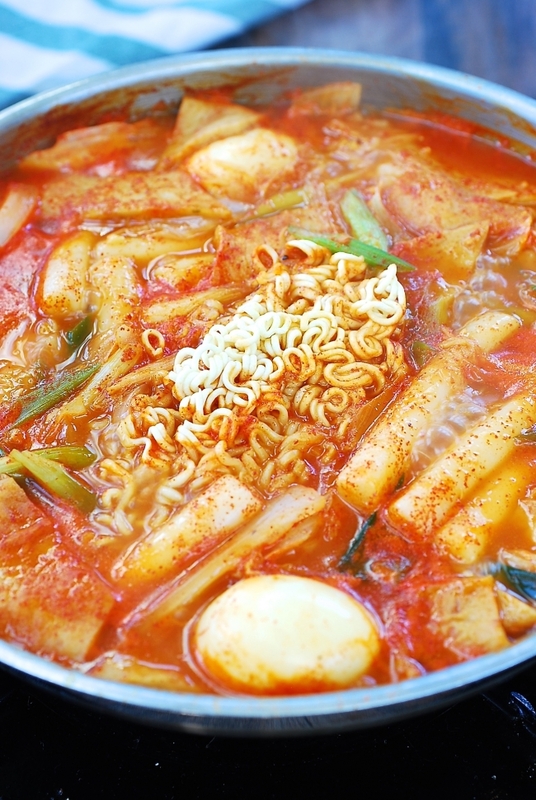 Tteokbokki is made with garaetteok (가래떡), a cylinder-shaped white rice cake. Thick ones are sliced into thin oval shapes for making tteokguk (rice cake soup). 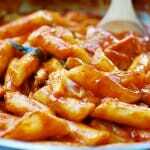 Thinner, shorter ones are used for tteokbokki, hence called tteokbokki tteok (떡볶이떡). You can use either one for this recipe. They are sold either freshly made, refrigerated, or frozen at Korean markets. 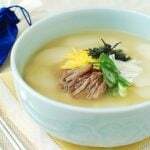 For a vegan option, you can use a vegetable broth and omit the fish cake and eggs. I used gochugaru (고추가루, Korean red pepper flakes) for spiciness in lieu of the gochujang (고추장, Korean red chili pepper paste) that’s used in the other tteokbokki recipe. 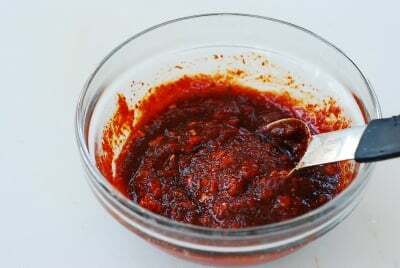 Gochujang is made with rice powder or flour, and thus it can make the broth thicker. So, gochugaru works better for a cleaner tasting broth. Finely ground gochugaru is best for this recipe, but not absolutely necessary. I finely ground my medium ground gochugaru in a spice grinder. For vegetables, I used napa cabbage I had in the fridge. 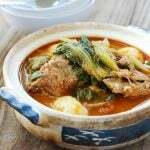 The soft, sweet cabbage is delicious with the spicy broth. It can certainly be substituted with green cabbage. 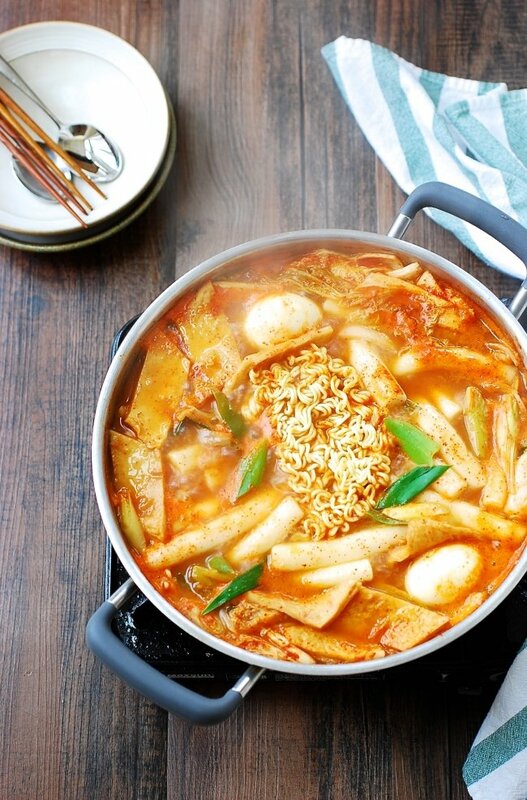 It’s common to add boiled eggs or ramen noodles to this type of tteokbokki, but they are optional. You can also use soaked sweet potato starch noodles (당면, dangmyeon), instead of ramen noodles if preferred. Soak the rice cakes for about 20 minutes if hardened or refrigerated. Make anchovy broth (see note). 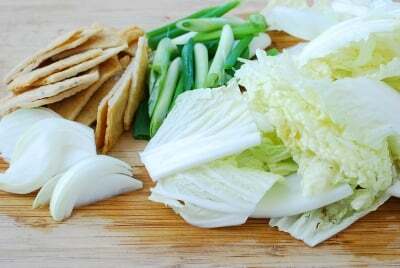 Cut the cabbage, fish cake, and scallions into about 2-inch long pieces. Thinly slice the onion. Mix all the seasoning ingredients in a small bowl with 3 tablespoons of the broth or water. Add the anchovy broth (or water) to a large pan or shallow pot. Stir in the prepared seasoning mix. Bring it to a boil over medium high heat. Add the rice cakes and cook, stirring occasionally. 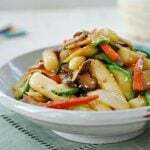 When the rice cakes started to soften, throw in the vegetables, fish cakes, and the optional eggs. 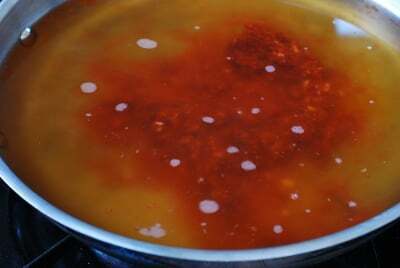 Continue to boil, stirring occasionally, until the rice cakes and vegetables are soft, about 10 minutes. Add the optional noodles with 2 minutes remaining. Add 12 to 14 medium dried anchovies (the guts removed) and 1 piece of dried dashima (about 4-inch square) to the pan along with 7 cups of water. Bring it to a boil, uncovered, over medium high heat, and boil for 10 minutes. For more ideas for broth, see anchovy broth. 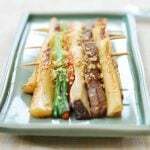 Where do I buy tteokbokki tteok? I can’t find it on Amazon. Any Korean markets near you? I get some hits by searching “Korean rice cake” on Amazon. Hope you will be able to find it. 너무 맛있어 보여요! Do you have a recipe for making vegetable broth? Thank you! The photos made my mouth water. I rice cake and your recipe sounds very interesting and delicious. I’ll try it next sunday and then I’ll let you know. Thank you! Oh, this is perfect for the cold, drizzly weather we are having in Los Angeles! Yuuum! Hello Hyosun! 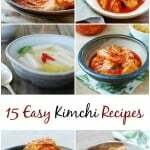 I am planning on making this recipe very soon and am wondering whether it would be possible to use fish sauce to replicate anchovy broth in any way (such as by diluting a few drops in chicken broth or water)? Also, I live in DC and buy my Korean ingredients at the Super H-Mart in Fairfax (it’s where I bought the tteokbokki tteok I’m using!). Do you have any suggestions for better places to shop in the DMV area or do you think I can find anything you include in your recipes at that store? Thank you for your lovely site! We use it all the time! Chicken broth or water is fine. You can use a very small amount of fish sauce if you want as a seasoning, but it won’t replicate anchovy broth. Fish sauce has a very pungent taste that anchovy broth doesn’t have. I usually go to H-Mart in Fairfax and Lotte Plaza in Centreville or Chantilly. Yes, you should be able to find all the ingredients I use at H-Mart or Lotte around here. Both stores sell freshly made rice cakes for tteokbokki, which I generally use. Thank you so much for using my recipes! Please let me know if you have any other questions. Happy to hear that! Thanks for letting me know. Cheers! My recipe doesn’t use it but, you can add a little bit of it if you want.